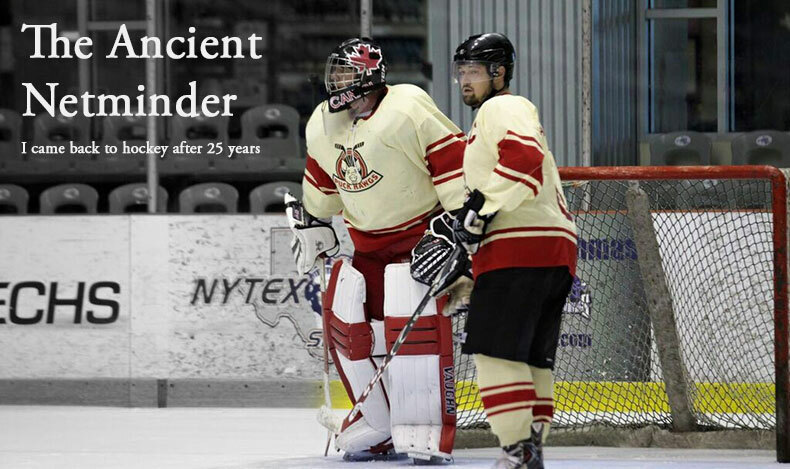 The Ancient Netminder: Everything is coming up roses! I must be setting ice time records for 47 year old goalies. With a very understanding and supportive partner (*waves to Amy), I have continued my breakneck pace at returning to hockey with games and practices four and five times a week. The biggest development in the past weeks has been adapting to my new, taller, Warrior pads. Despite struggling with a very painful knee injury, I've been on the ice practicing and playing with my new pads and the results have been very positive. The most obvious improvement is my lateral movement followed by more net coverage and smaller five hole. While continuing to improve my butterfly technique, My coach added a new skill to my list- butterfly pushes. While down on the ice in a butterfly stance there is often a need to move to a different position and angle without having time to recover to your feet and reposition. The butterfly push has you remain on the ice, put the outside foot back up on the ice and push/slide to the new position. This atom goalie performs the butterfly push with ease- note there is no video footage of mine. I've also played the first two games of our new I-League season and our team has opened with back-to-back victories and a personal GAA of 2.5. There is no question that the new pads have given me more confidence as well as helping me with technique. I'm playing better than I ever have and recently was asked to play for a newly-formed "D" league team- more on that soon! Closing out this entry is some bad news... I've lost my goalie coach known as "The Punisher". Hopefully not because of frustrations related to trying to school an old guy like me in the modern game, The Punisher packed up this week and moved north to Michigan. I choose to believe he was seeking the better ice of northern climates rather than running away from Texas. In any case, best of luck to him.